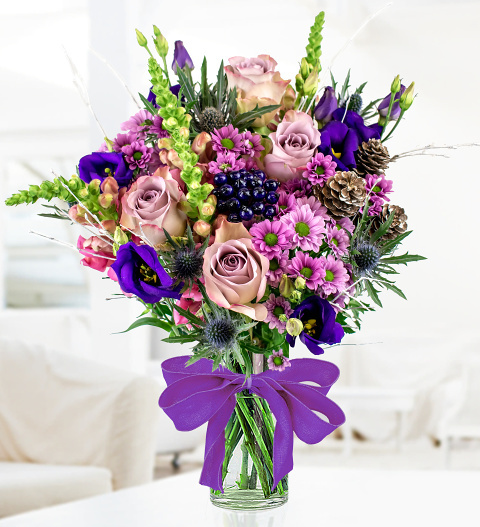 Our December birthday bouquet is inspired by the stunning birthstone Tanzanite. Did you know it was given the name by Tiffany & Co. after Tanzania, the country in which it was discovered? This stone is a stunning colour of blue, violet and burgundy depending on crystal orientation. Which is why our florists designed the perfect bouquet with Memory Lane Roses, Snapdragons, Lisianthus, Santini, Chrysanthemums, pine cones, and berries too. This arrangement is both personal and breathtakingly beautiful which makes it perfect for making your loved one feel pampered for their birthday. Chocolates may contain nuts.